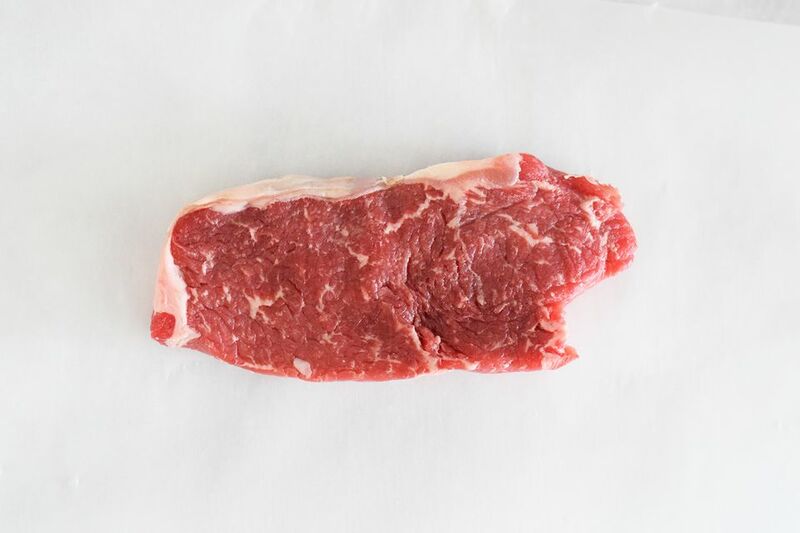 Steaks start out almost perfect, especially when you purchase a good steak. One rule about the way steaks cook is that the fat will shrink faster than the meat. This can cause the fat to fold or compress the meat. This pressure can squeeze out the juices and make the steak more difficult to eat. So, occasionally you might trim a steak to make it cook better. This will also reduce the risk of flare-ups by reducing the amount of fat. Of course, the fat is important to the flavor of a steak so it best not to cut it all off. Here we have a nice New York Strip. This steak has a nice thick strip of fat running down one side. This strip of fat is too thick to really benefit the steak. Of course, you could leave it alone, but it would benefit your heart health and the outcome of the cooked steak if it is trimmed first. Remember that this strip of fat is going to shrink a lot more than the meat, so you need to break it up a bit. As mentioned before, the strip of fat running along the side of this steak is pretty thick. Ideally, this should be a thin strip around 1/8 to 1/4 inch in thickness. Don't worry about getting it too even but don't cut into the meat of the steak. Look to the corners to find large chunks of fat. By reducing the fat to an even strip all the way down you will help the steak cook more evenly. Trimming down this excess fat will reduce the risk of flare-ups the amount and of drippings that collect in your grill. This will also reduce the fat percentage of the steak by making it leaner. Yes, I agree that there are few things better than the fat off a good steak, but some sacrifices have to be made and it is far better to eat a healthier steak today than no steak tomorrow. Looking at the steak we can see that while there is still a nice strip of fat on the steak, the fat is greatly reduced. This steak will still be tender and flavorful. The most important fat in any steak is the fat in the meat, not the fat around it. While this strip enhances the flavor, it doesn't do too much to adding moisture to the meat of the steak. Now it's time to deal with that strip of fat. Though thin, it is still strong and prone to shrinking much faster than the meat. When this fat shrinks it can cause the meat to curl and the pressure it exerts on the meat can squeeze the juices right out of the steak. Stand the steak up on the fat-free side and use your knife to cut through the fat strip right up to the meat, but not into the meat. Make one of these cuts every inch along the fat strip. As the fat now shrinks it won't have anything to hold onto to curl the steak. What is an Under Blade Steak?